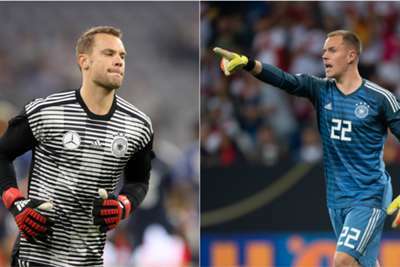 Marc-Andre ter Stegen should take the Germany number one spot away from an out-of-sorts Manuel Neuer, former captain Lothar Matthaus has said. Bayern Munich goalkeeper Neuer has struggled to hit top form since returning to action following his long absence due to a foot injury last season. The 32-year-old was unconvincing in Germany's shock group-stage exit at the World Cup and came in for criticism for his performance in the 3-0 Nations League loss to Netherlands last Saturday. Ter Stegen has only started two matches this year – friendlies with Spain in March and Peru last month – but Matthaus thinks the Barcelona man has earned the right to a regular spot in Joachim Low's starting line-up. "Manuel Neuer doesn't currently have the form and assuredness he had before his serious injury," the 1990 World Cup winner wrote in his column for Sky Sport. "He's not yet back in the shape that made him the best goalkeeper in the world four times [according to the International Federation of Football History & Statistics]. "[Ter Stegen] has been world-class at Barcelona for years. I think he's gradually earned the chance to play an important match from the start, even if Neuer is available." Germany take on France in their latest Nations League match in Paris on Tuesday.